Ashbury 4-pc. King Bedroom Set If you’re an admirer of all things classic and refined, you’re going to love this Ashbury 4-piece king bedroom set. From its beading to its reeding, this bedroom set is a perfect example of fine detail and superior craftsmanship. Plus, you'll appreciate how the beautiful veneer pattern on the drawer fronts adds interest to the cherry finish and how the mirror's arch mimics that of the headboard, giving the set a grand presence while also accentuating its timeless design. If you’re an admirer of all things classic and refined, you’re going to love this Ashbury 4-piece king bedroom set. 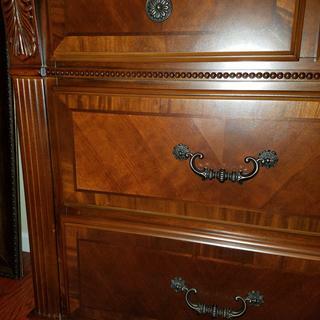 From its beading to its reeding, this bedroom set is a perfect example of fine detail and superior craftsmanship. Plus, you'll appreciate how the beautiful veneer pattern on the drawer fronts adds interest to the cherry finish and how the mirror's arch mimics that of the headboard, giving the set a grand presence while also accentuating its timeless design. L: 89" x W: 83" x H: 65"
L: 64" x W: 18" x H: 38"
L: 47.5" x W: 2.5" x H: 47"
Purchased this bedroom set at raymour & flanigan store during friends and family sale.What struck the most about this set is its vintage look and its price point.I liked some other sets but none offered such a value at the price.I will definitely recommend this set. The first time that I saw this loved it. I did not think that all the pieces would fit in the bedroom. But they did and we are comfortable there is room to walk around in. I can put a chair in the corner. The salesperson ***** ****** was wonderful. 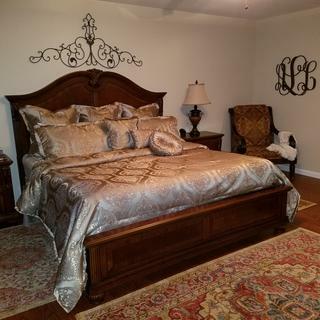 I purchased this set for our master bedroom during the Friends and Family sale and what a great deal it was! I love the detail on the wood and the gorgeous hardware pulls and knobs. This set is so classy and elegant looking without being too gaudy. We purchased the king bed, two night stands, dresser without the mirror and the tall dresser as part of this collection and could not be happier with it. I have been searching for a new bedroom set for a long time and was so excited to have found this beautiful set for a great price. Tons of storage space. Our jeans fit folded in half inside the long dresser. Smaller drawers are great for t shirts, undergarments, socks etc. My husband doesn't believe how inexpensive it was!! Completely transformed our bedroom into a stunning master retreat! Have had so many compliments on it. I highly recommend this set. It is traditional and will never go out of style. Just perfect! Had a fantastic delivery experience. So much care was taken to ensure the pieces arrived in perfect condition. One night stand had a small defect which was quickly fixed with a simple phone call. Exceptional quality and customer service experience. I got this set for my bedroom. It is very sturdy furniture and a beautiful color. A great set to have for a master bedroom. For the price we paid. You can't complain. Classy looking and a very good starter set, maybe more for my wife and I. Very happy. Does it have bed frame so I need only only box spring and mattress to add? OR I need to buy bed frame as well? BEST ANSWER: The frames is a part of the structure of the bed. An additional bed frame is not required. Does this bed require box spring? can I buy a full size bed? BEST ANSWER: I'm sorry. The Ashbury bed is not available in a full size. What store location holds this product? BEST ANSWER: This bedroom set can be seen at many of our Raymour & Flanigan showrooms. If you would like to know if this is in a store near you please call the Raymour & Flanigan online sales department at 866-383-4484 option 3. What height box spring does this bed require? Low profile or standard? BEST ANSWER: Either size boxspring will work. I purchased standard. Can I order the dresser draw handle? BEST ANSWER: For assistance with a replacement handle, please contact Customer Care at 866-383-4484, option 7. 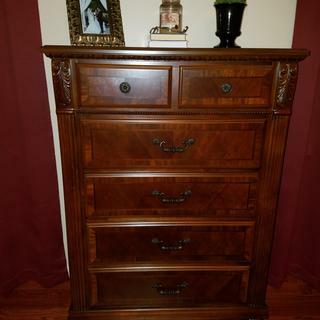 Can I just buy one bed frame and two night stands in the Ashbury King collection without the dresser? BEST ANSWER: Yes. Each of the items are sold individually. is this bed room set in white or ivory color ? BEST ANSWER: Although the Ashbury collection is not offered in white or ivory, the Kylie 4-pc. King Platform Bedroom Set, SKU # 596279907 may be of consideration. Does this collection have a chest? how many pieces will i get with this set? BEST ANSWER: The Ashbury 4-pc King Bedrom Set includes the bed, dresser, mirror and nightstand. What is the four pices? BEST ANSWER: The four pieces are the bed, dresser, mirror and one nightstand. 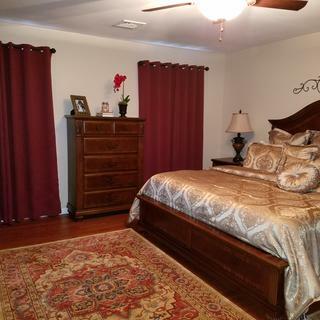 what material are these bedroom sets?? BEST ANSWER: The Ashbury collection is made of kiln-dried solid poplar, pine, furniture-grade plywood and engineered hardwood frame materials with cherry, primavera and walnut veneers. I would like an extra side cabinet aside of bed how much is that? BEST ANSWER: Yes, you may purchase an additional nighstand. Please view SKU: 515165745 for details and pricing.